Post #454 The World’s Megacities Are Set for Major Growth… – @Informal Blog for professionals Facility Management. Megacities are defined as metropolitan areas with a total population of over 10 million people and examples include Tokyo, Mumbai and Mexico City. 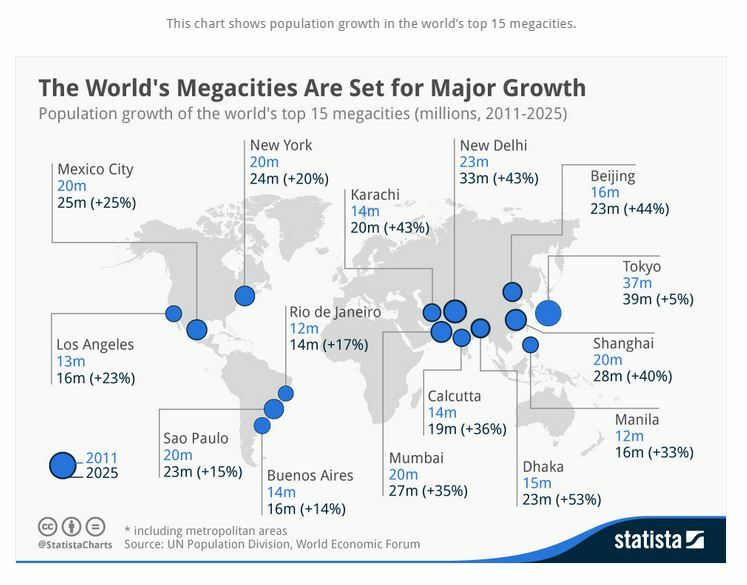 Currently, there are 25 megacities across the world and these are set for major growth over the course of the next 10 years. By 2025, there will be 35 megacities. Some of the fastest growth will occur in Dhaka which will see a population increase of some 53 percent. Beijing is set to expand by 44 percent while New Delhi’s population will rise by 43 percent. Tokyo’s population will increase from 37 million to 39 million. In fact, if the Japanese capital were considered a country, it would be the 31st largest in the world by 2025.